September 1939 and Poland is partitioned by Hitler’s Nazi Germany and Stalin’s Soviet Russia. Stefan Korbonski after escaping from Russian capture has returned to Warsaw. It is mid October and the city has changed. Stefan Korbonski went to visit his friend Matthew Rataj, chairmen of the Polish Peasant Party and former Speaker of the House. Korbonski tells him that he is thinking of escaping from Poland to join the Polish Army being formed in France. Rataj explains to Korbonski the conspiracy that is being planned. He tells him that together with Niedzialkowski, the leader of the Polish Socialist Party, they are intending to set up an underground organisation covering the whole country. The conspiracy will be led by the opposition parties which have proved their loyalty to democratic ideals. Rataj asked Korbonski to change his mind about leaving the country and to instead join the underground organisation. Korbonski readily agrees and looks forward to the prospect of an armed struggle against the occupying powers. A few days after Korbonski’s meeting with Rataj the Gestapo visit Rataj at home and arrest him. He is taken to Gestapo headquarters at Szucha Avenue. Korbonski meets with Niedzialkowski and is asked to assume Rataj’s role as a deputy. He then meets with Colonel Rowecki, Chief of Staff of the Military Organisation. On 23 December 1939 Niedzialkowski is arrested by the Gestapo and taken to Szucha Avenue. He is then incarcerated in Pawiak Prison. On 21 June 1940 both Niedzialkowski and Rataj together with others are taken to a wood at Palmiry and shot by the Gestapo. In April 1941 Stefan Korbonski became the representative of the Peasant Party at the High Command of the Union of Armed Struggle (later known as the Home Army). He was later also given the position by General Rowecki of the Commander-in-Chief’s Plenipotentiary for matters of Civil Resistance. Korbonski had a dream that the Underground organisation would be able to keep in touch with the Polish government-in-exile in London by radio. Korbonski met with a young man called Joey who said he could build a transmitter which would enable contact with London to be established. After a number of attempts contact was successfully made on 2 August 1941. Korbonski knew that the Gestapo were searching constantly for both him and for the underground radio transmitter. They had to constantly change the hide-outs that they used to transmit their radio messages from. In late 1942, Stefan Korbonski’s wife Zosia, in a secret hide-out, was deciphering a transmission from London. The transmission asked if they were listening to a secret underground radio station broadcasting in Polish each day at 8am and 7pm on the 31 metre band. Stefan Korbonski was astonished as he knew nothing about this station. At 7pm that day they tuned their radio and found the powerful station. They were amazed that an underground station was able to able to broadcast with such technical perfection. Later they received a telegram from London marked Top Secret. They were not to reveal the information to anyone. The telegram said that the secret radio station was not in Poland but was broadcasting from an allied nation. The station gave the impression that it was located in Poland in order to confuse the Germans and to make Western nations place greater trust in its reports. London suggested that in order for this deception to continue the radio stations in Poland would need to supply the secret radio station with detailed news of daily events in Poland. It was not until early 1944 that a German newspaper, published in the Polish language, Nowy Kurjer Warszawski, revealed that SWIT was broadcasting from England. Stefan Korbonski sent several radio messages to London in July 1942 advising that the Germans had begun to liquidate the Jewish Ghetto. 7,000 Jewish people were being daily put into a train of freight cars, sent to Majdanek and murdered in the gas chambers. Korbonski was astonished when the BBC did not broadcast his news. Neither the British nor the Polish government-in-exile believed that this could be happening. It was only a month later after the British had confirmed the news through other sources that the BBC broadcast the news. On 1 August 1944 in Warsaw the Polish Home Army attacked the Germans. The Warsaw Rising had begun. 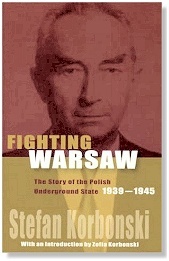 Stefan Korbonski was introduced to an Englishman called Lieutenant Ward who was hiding in Warsaw after escaping from a prisoner of war camp. He asked Ward if he would draft telegrams of German atrocities that he had seen. Korbonski thought they were more likely to be believed in London if they were sent by a member of the British armed forces. The BBC and the British press gave prominence to Wards’ reports. Korbonski received a telegram for Ward offering him the post of Warsaw correspondent for The Times (London) newspaper. Ward gladly took on the role. Stefan Korbonski travelled to Piotrkow for a meeting of underground leaders. The meeting took place at the monastery in the center of the city. He spent the night in a crowded monastery cell with a Polish doctor and a diplomat. A monk visited them and offered them brandy brewed at the monastery. In March 1945 the Soviets issued an invitation to the Polish underground leaders to take part in talks with them. The Government Plenipotentiary and the Commander of the Home Army, Okulicki, accepted the invitation and together with other leaders went to meet with the Soviets. Zosia, Korbonski’s wife, believed the meeting was a trap. It was. The Soviets arrested the fifteen underground leaders. The entire Council of Ministers and the principal Party leaders had all been arrested. Korbonski’s interrogation continued day after day, night after night. He was persistently called upon to condemn the activities of the Underground under the Soviet occupation. After spending several weeks in prison he was set free. On 5 November 1947 Stefan Korbonski and his wife escaped from Poland and made their way to Sweden. Publisher - Published by Hippocrene Books in 2004. First published in 1956. Stefan Korbonski died in 1989 aged 86. Obituary in New York Times (US) 25 April 1989. Presidential Visit to the United States of Lech Kaczynski, President of the Republic of Poland February 9 - 10, 2006. He met with Zofia, widow of Stefan Korbonski, and presented her with the Grand Cross of the Order of Poland Reconstituted. Article and Photo Gallery. This page was added on 06 February 2010.